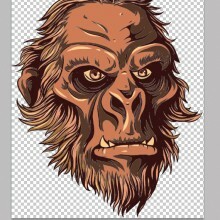 Sculpting is an art that has defined us from the dawn of humanity. We slowly started polishing stone, marble, ceramic and wood creating beautiful, staggering pieces of art. Sculpting has its origins in Ancient Greece, and the Greeks are widely known as producing ones of the most incredible pieces of sculptures in the classical period. Gothic sculptures became popular in the Middles Ages, and were a representation of Christian faith. In the Reinassance era, classical models were brought back by famous sculptures such as Michelangelo, Brunelleschi, Donatello and Lorenzo Ghiberti. Now, modernist sculptures focuses on depicting the human body, and using assemblage. We have rounded up 9 unusual and creative sculptures and statues from around the world so we can experience a little part of this beautiful form of art. 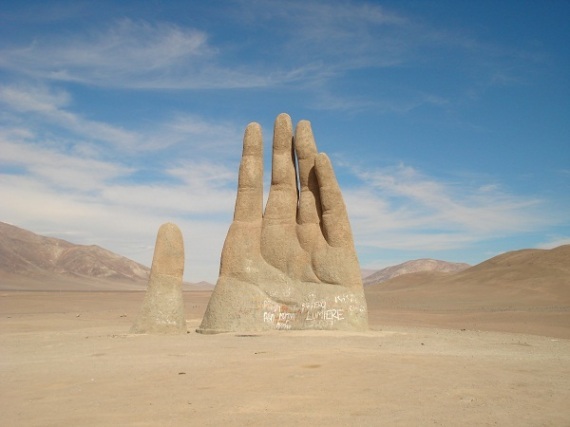 The Giant Hand, or Mano del Desierto, is an incredibly large sculpture of a hand, and is located in the Atacama Desert, in Chile. It has been constructed by Mario Irarrazabal, a Chilean sculptor, in 1992. Its base is made of iron and cement, and has a height of 11 meters, or 36 feet. It is a representation of injustice, loneliness, sorrow and torture. 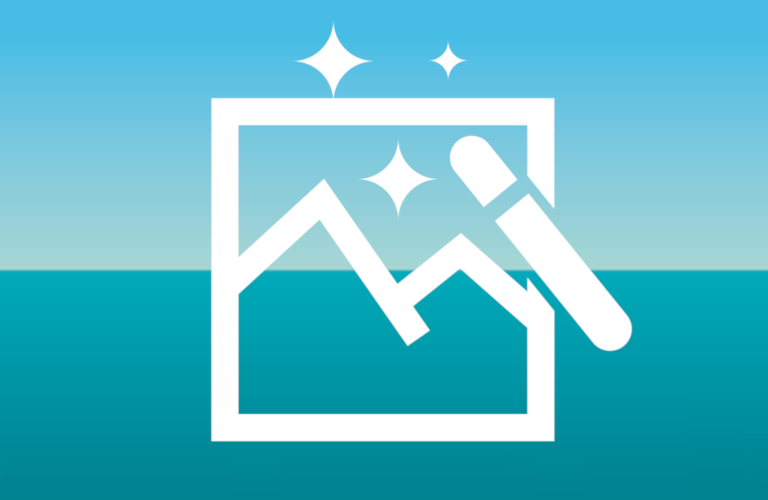 Its size is used to depict humanities vulnerability and helplessness. Unfortunately, The Giant Hand, has been vandalized countless times by graffiti – it is being cleaned occasionally. Saint Wenceslas, or Svaty Vaclav, is considered to be the national patron saint of Bohemia. He is a Czech national hero, murdered over a thousand years ago by his brother Boleslav – he is widely known in the Czech Republic as “ The Good King Wenceslas”. It was designed and constructed by architect Alois Dryak, who included the inscription of – “Saint Wenceslas, duke of the Czech land, prince of ours, do not let perish us nor our descendants “. 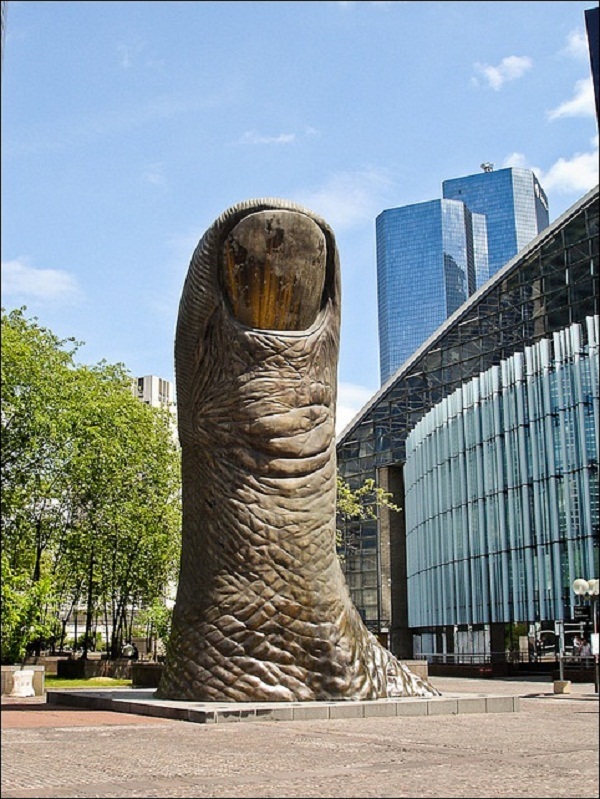 The Giant Thumb sculpture was created by artist Cesar Baldaccini, and it has a height of 40 feet, and it stands in the financial district of Paris. It is basically an 18 ton thumb that sticks out. The Thumb was build in 1965, and it is considered a signature move for Cesar – who just loved to use modern construction methodology, mold his thumbs, or fingers, and create absurdly large versions of them. 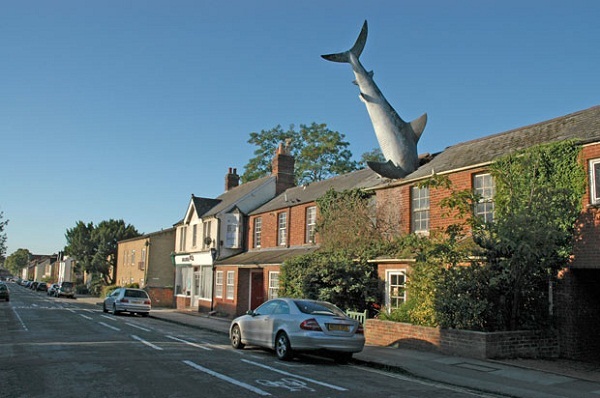 The Headington Shark is a rooftop sculpture created on August 9th 1986, and it weights about 200 kg, and is 7.6 meters long – it’s made of painted fiberglass. It is considered to depict someone’s feelings of being impotent, of anger and desperation. It is expressing feelings of total disgust against nuclear power, and the tragedies that have occurred in Chernobyl and Nagasaki. It is a means of ripping a hole out of the roof, so everyone can clearly see what is going on. You may think that its being held in the air by some sort of metal wires, but it’s not. It is not hovering in the air at all. 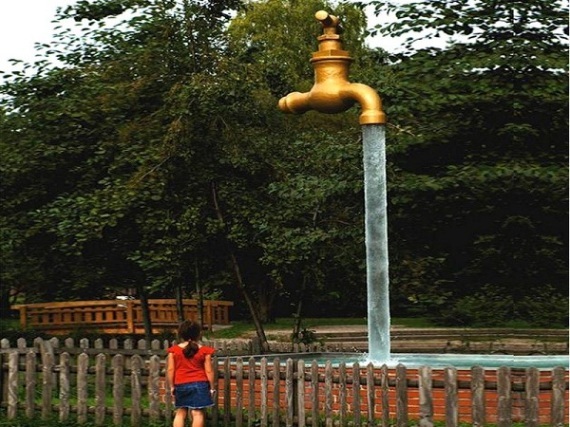 The shaft of water is solid and is suspending the tap in the air, creating this marvelous illusion. If you are going to Switzerland in the near future, I highly recommend you go see this for yourself. Kafka was a German writer of novels and short stories, and he is known by critics as being one of the most influential authors of the 20th century. His stories are filled with themes of alienation, psychological brutality, terrifying quests and transformations. 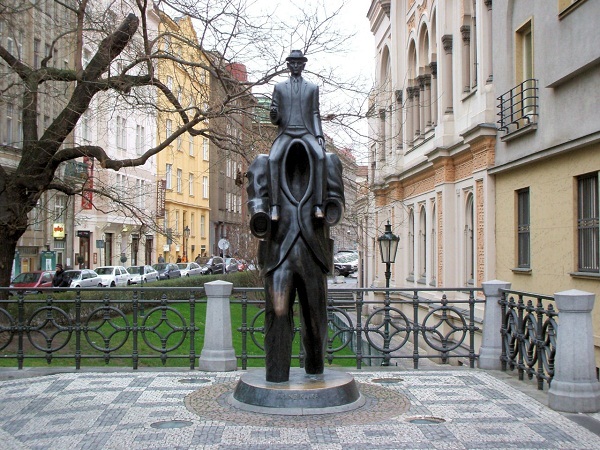 This homage has been created by sculptor Jaroslav Rona, in 2003, for the 120th anniversary of Kafka’s birth. Jaroslav inspired himself from one of Kafka’s stories – Description of a Struggle. 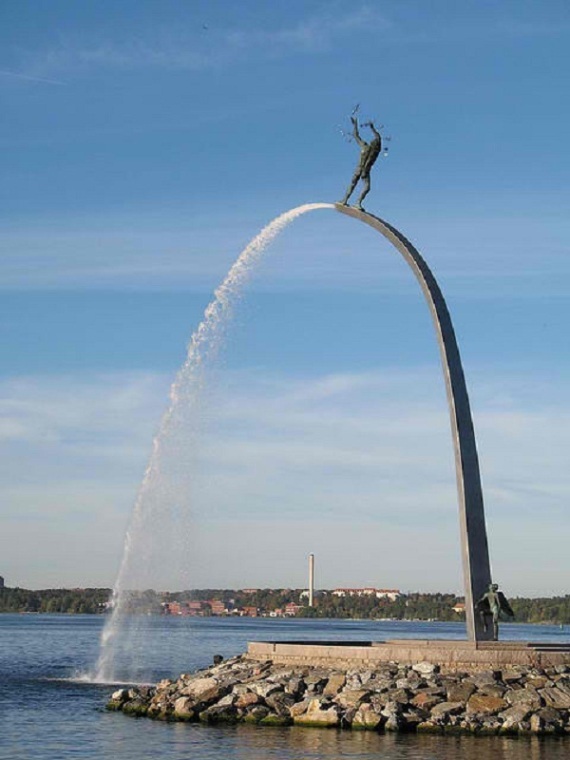 This sculpture depicting mans need to reach divinity was created Carl Milles, a Swedish sculptor. He was born on the 23rd of June, 1875 and died on the 19th of September 1955. He left his mark on this world by creating staggering pieces of art work, such as the Poseidon statue in Gothenburg, the Gustaf Vasa statue for the Nordic Museum, the Orfeus group that is located outside the Stockholm Concert Hall, and the beautiful Folke Fillbyter sculpture in Linkoping. 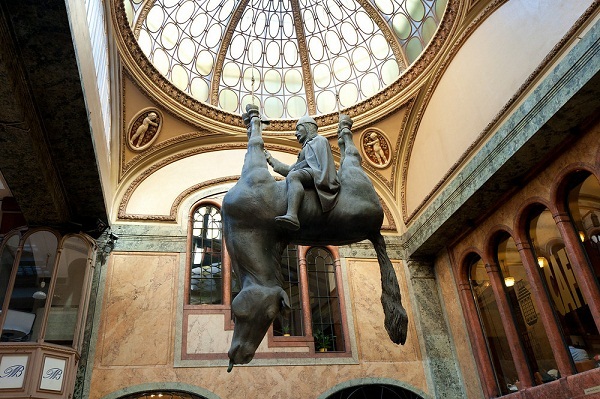 The author of this surreal looking sculpture is unknown. 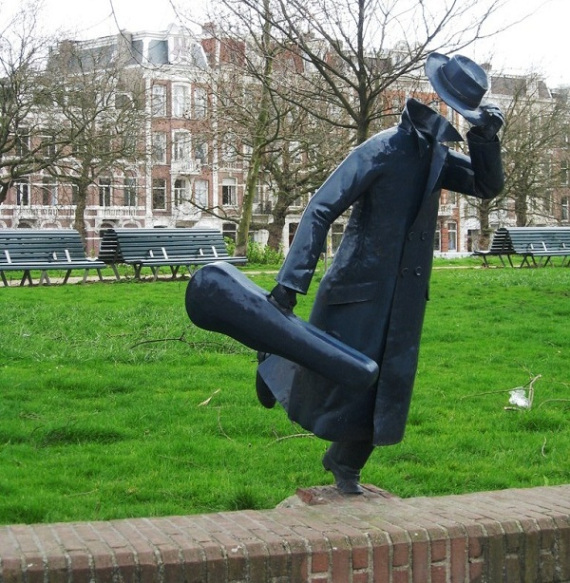 The headless musician is located in Marnix Park, in Amsterdam, and was created between 1982 and 1999. The author used to leave such bronze sculptures throughout the city. Some say that a doctor who crafted sculptors in spare time is the mysterious author, others say that is just a crazy lunatic suffering from Alzheimer’s disease, we like to think that whomever done this marvelous piece of art is a human being that just loves sharing his work. This beautiful and sad piece of art was made to commemorate the Jews that were killed by the fascists Arrow Cross, during the World War II. 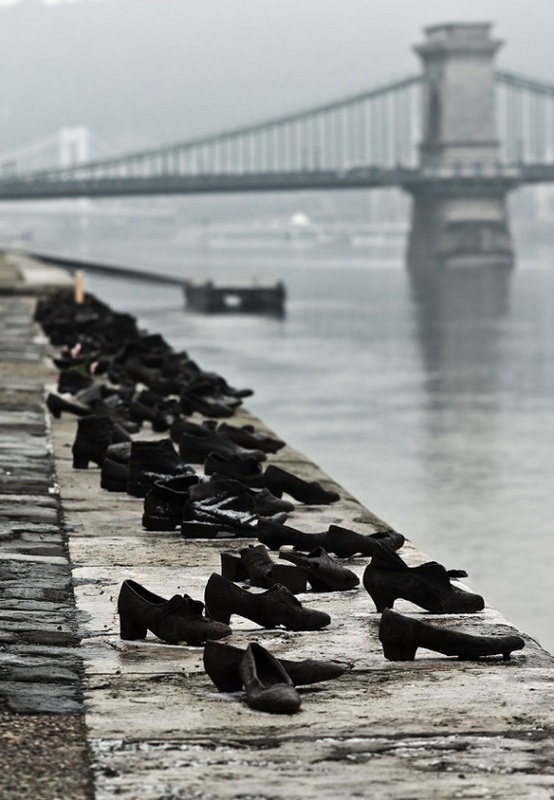 Fascists forced the victims to take off their shoes before being shot on the water edge. It is to remember ourselves of a cruel time that we deeply regret it happened. It is to remember ourselves that we should not allow this to happen ever again – genocide is an abomination and it must remain in our deep and dark corners of history. Our journey has ended, and we hopefully made you forgot about time and gawk at these sculptures. 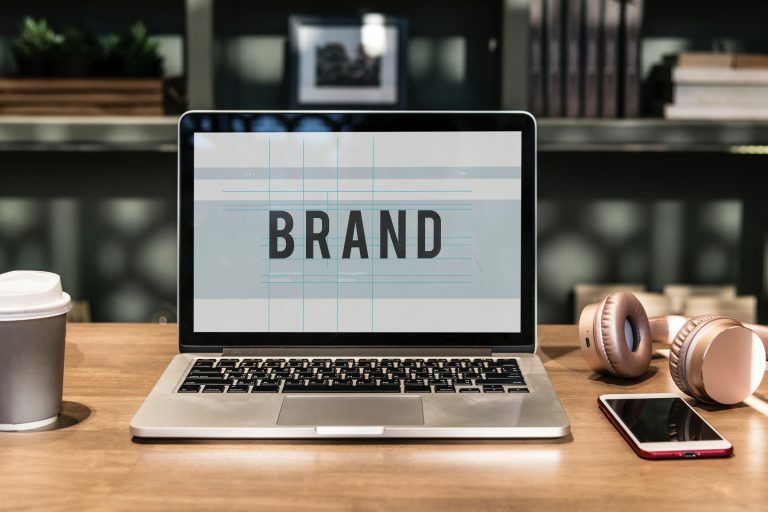 Do you have a favorite one from the list? 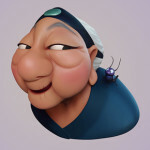 Do you wish to share a sculpture that was not posted here? Well, you can do so by posting in the comments section below. 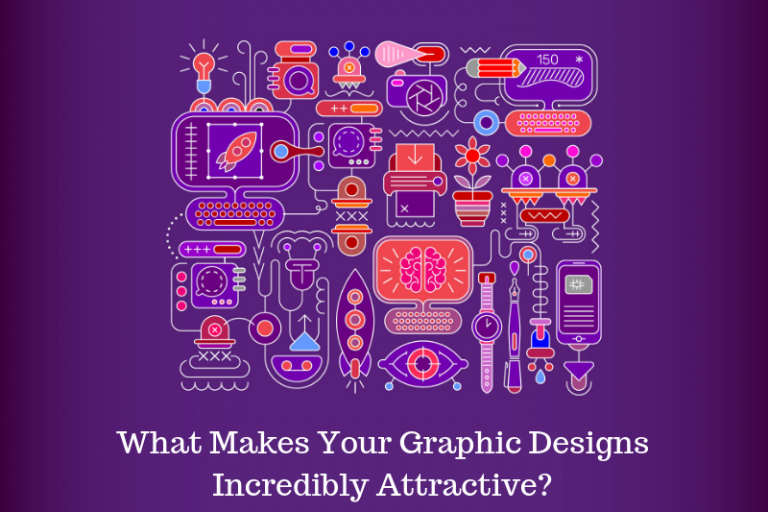 We would love to hear you out!